No matter what type of weather you are riding in it is important to be comfortable as you ride. It is as important as it is to stay hydrated in the extreme heat. In cold weather, we want to protect our bodies because there are physical symptoms involved with cold weather exposure. Hypothermia can be a problem if you let yourself get cold enough. Some of us consider ourselves tough and will be shivering as we battle the cold riding. If you are like me I take these things as a challenge at times but this could be a symptom of hypothermia. There are other symptoms as dizziness, exhaustion or skin discoloration. Many health services warn of these possibilities to protect us from over exposing ourselves to cold weather. Okay, tough riders I know we want to say mentally but it takes some help of dressing properly as well. In the cycling world, there are some great items you can purchase to help you battle cold weather. There are some attractive thermal cycling outfits in men & women models that help you stay warm and look good. There are other items such as a mask, gloves, socks, helmet liners and even heated items that will give you a chance at being comfortable when the weather is a little bit too cold to have to ride in without some skin protection. You might say why ride in it? But for some of us, it just goes with the territory. 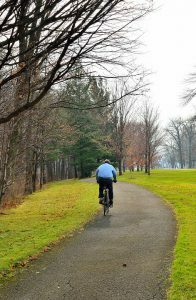 This site has a store that you can browse around in with many of the cycling needs that can help you keep warm as you take on the colder days of riding your bike. 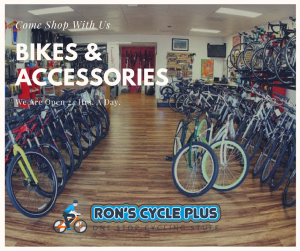 Take a look at Ron’s Cycle Plus while you are visiting. After all, we like to not only provide information we also like to make available some great products to try and help you save at the same time. Cold-weather warmth is more than keeping the cold off your body it is also important to stay dry. We all know that once the hands and feet get cold we are about to lose the battle. So make sure you have something on that will help keep you dry in case of a little condensation in the air or rain. Once you get wet it will be hard to fend off cold weather no matter what you have done to prepare yourself. I have been through that before and I am sure some of you have too. So this cold season dress appropriately and enjoy your bike riding because I know there are some of us that will not let the temperature deter us from hopping in the saddle and riding where we want to go or just the normal ride out that we love to do sometimes. Thanks for visiting and feel free to share some of your cold riding moments with everyone. There is nothing like the old riding tales. Who says fisherman can tell the best tales. Thanks for this post, like the ideas and was a nice read. I have ridden some a few years ago in the cold and I didn’t mind getting a little wet, it was the wind that got me every time. The wind causes many problems. Not only will it chill you if you are damp but it adds great resistance to your pedaling. A lot of times I go into competitive mode on good windy days to complete my ride. But it does provide a good workout as well. Thanks for this useful information. I like to have comfort while cycling in any season. Preparation is extremely important in cold weather and the cycling outfits are a must-have to provide the protection needed. I will keep these great tips in mind the next time I ride! Great. I want you to stay warm and enjoy your rides. Thanks for the post. I had a look on your cycling store but did not have much luck in finding what I wanted. I am looking for a breathable material (a jacket most preferably) that still works to give me ample shelter from the cold but like I said it breathable and fairly light. I understand this might be a bit of a stretch but I am looking for just one jacket I can buy that will fill these criteria. Okay, I will look into adding it to my store because I am sure there are others who would want the item as well. Thanks for making me aware of that. Ronnie, thanks for this informative article. Staying dry and warm during the cold months is important for the cyclist. When I lived in Minnesota, a friend of mine would cycle throughout St. Paul. When he would finish his ride, he came back with ice cycles hanging from his beard. Your clothing needs to not only protect you against the elements, but also pull the sweat from your body. Good article. You are welcome. Cutos to your friend. A lot of people would not dare to ride in the cold but if it is your passion you will. Tell him I said keep on pedaling. I grew up in the bush in Alaska and we had to be very careful of hypothermia in the winter when traveling outside. We lived off the road system so there were no cars. We traveled by snowmachine, skis or dog team in the winter and by 4-wheeler, canoe or airplane in the summer. Being outside so much in cold weather meant a high change of getting hypothermia if not fully prepared. Materials like wool are great because they wick away moisture. Now there are many modern wicking materials that are great at this. There is a saying among outdoorsman that “Cotton kills”. This is because cotton does not wick moisture away from the body and if you are wet you will get very cold and could die. Even sweat can produce plenty of moisture to dampen your clothes and kill due to hypothermia. Proper clothing is very important! Thanks for sharing that information. You were where it really counted to be conscious of how to protect yourself from hypothermia. I am sure some other readers will be glad to know this about certain materials.